I kept looking at the beginning of Chapter Four, Colour Work, which starts with this pattern, Simple Vertical Stripes, and thinking “ugh!” This pattern reminds me of Phentex slippers and old ladies’ tea cozies. I decided that I had to bite it and get going because I actually love colour work and am looking forward to later things in this chapter. 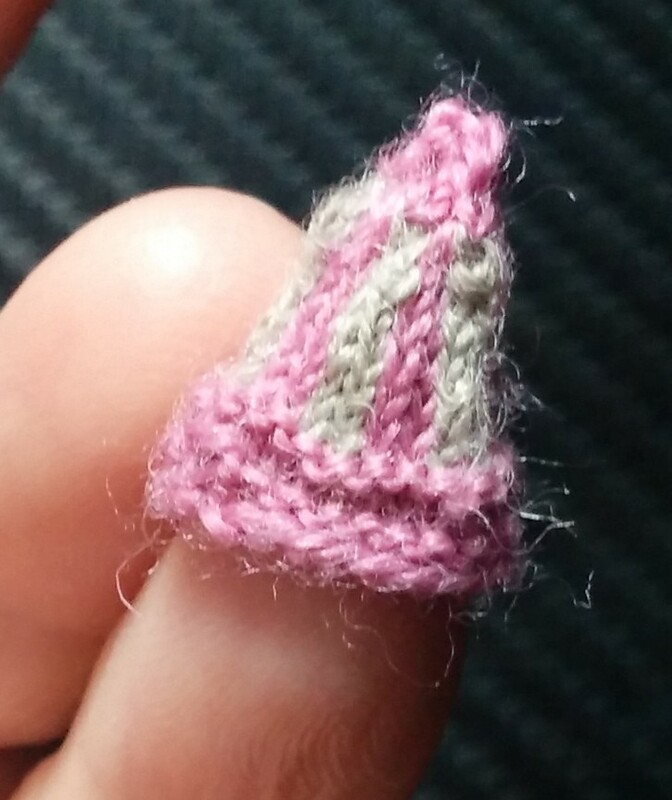 My compromise is to make a little hat which I can stick in the drawer of the doll’s dresser. It needs to be populated anyway. 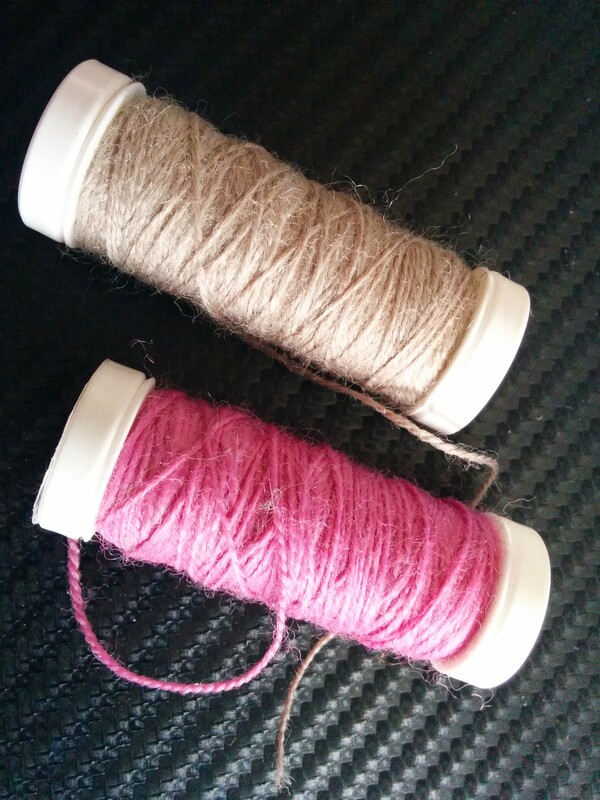 I used 1 mm (US 00000) needles and some knitting-in wool from spools I bought at one of my local wool stores. Yarn Forward. So now I am passed that little hurdle, I have made a couple of regular hats with some of the colour change patterns after that one. 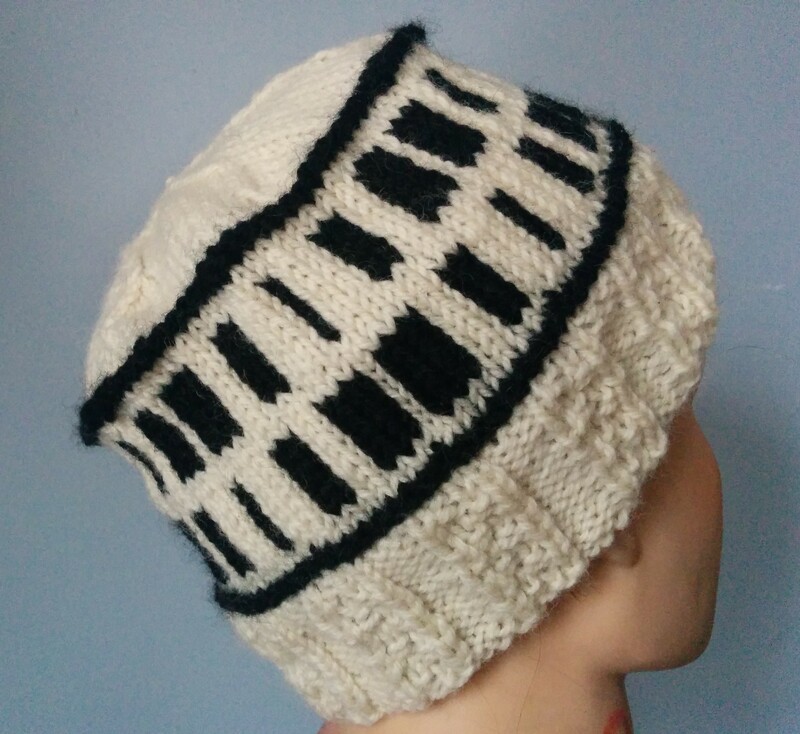 This hat uses the next two patterns in the chapter. I redid the top four times before I left it. I tried to disappear the stitches staying in the two-stitch check pattern several times before giving up and putting this top on it instead. I used 9 points of decrease, decreasing on the white (knit) rows, alternating with plain rounds of black (purl). I did another hat this way a month or so ago before I fired the blog back up. I then carried on. 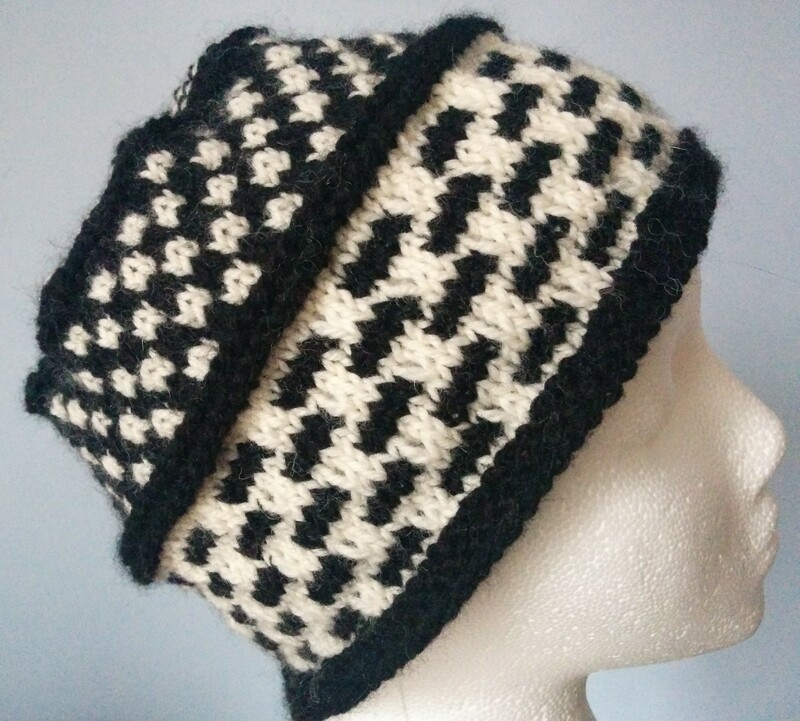 I really was not fussed about this, (Elongated Check) pattern, but it is OK on the hat, I think. Better done than perfect, as they say. Whoever THEY are. 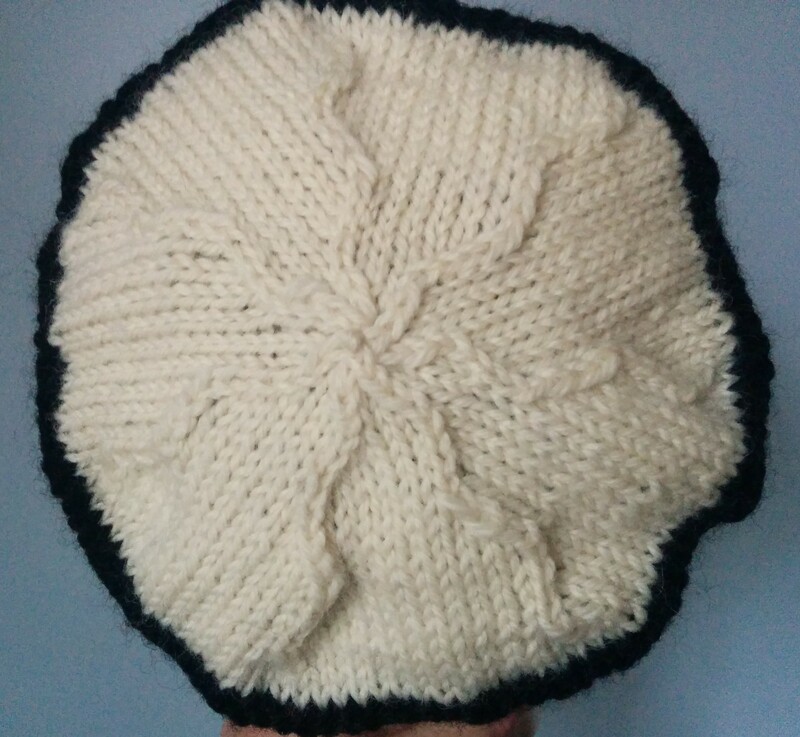 This hat also uses the next stitch in Chapter 3, Ribbings- Embossed Moss Stitch Ribbing. I played with disappearing the stitches in stockinette stitch on the top using 7 points of decrease. I did ssk at the beginning of each decrease section every row for 3 rows, did a row with no decrease, then did three rows where I did a k2tog at the end of each decrease section, followed by another plain row. I alternated like this till I had nothing left. I quite like how it looks. 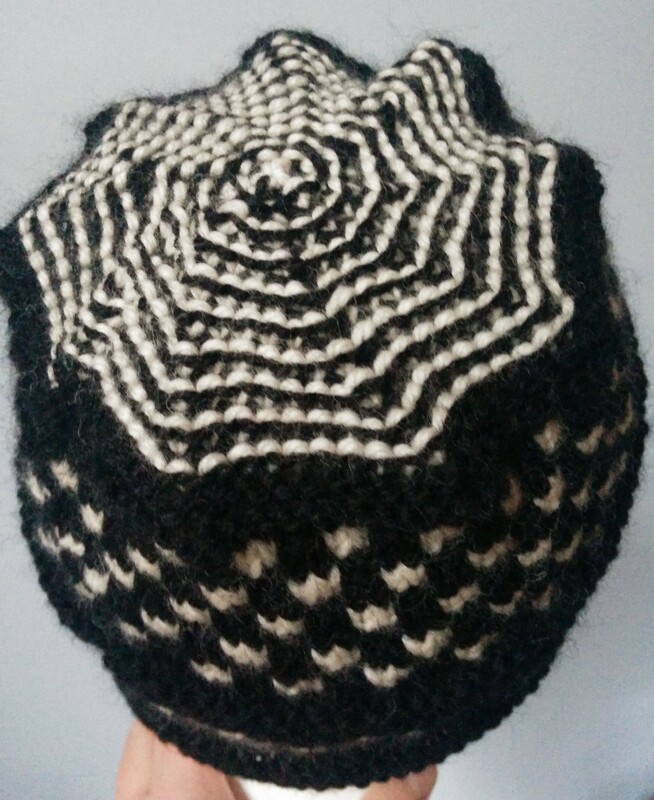 This entry was posted in Barbara Walker and tagged Barbara Walker, knitted hat on April 6, 2015 by gillianknitter. I love the shape of these 2 black and white hats. The checked pattern you’re not too fussed about reminds me of bar codes. I kinda like it. Yeah, Jacob was home on the weekend and he thought it was OK too.